Vroom Kaboom is a brand-new type of gameplay experience from Ratloop Games Canada. This game combines elements from collectible card games, tower defense and multiplayer online battles. Build a deck of vehicles and deploy them into battle against other players online. It ends in destruction. With over 70 different vehicles and units to choose from, build a deck that fits any strategy and playstyle. Play and win matches to gain new cards and scraps, and in turn unlock new and more powerful units to add to your collection. Collectible cards range from motorbikes, trucks, cars, tanks, helicopters, missiles to planes. Strategically use your cards to summon vehicles and deploy them on the battlefield. Drive, jump, shoot, bomb and ram your way to victory. Crash into your enemy’s vehicles, blow up their defenses and destroy their oil tanks to secure the win. Don’t be a rookie, try summoning multiple vehicles at the same time. 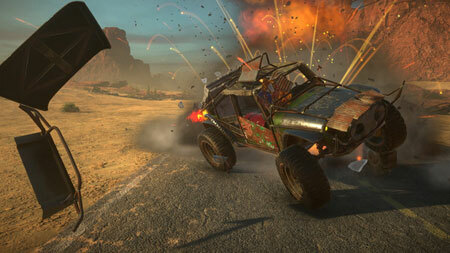 Choose from our 3 playable factions: SkullBorough, Drift City and Soul Station. Each contain unique cards to collect, vehicles to drive, environments to play in and music to enjoy. If you get stuck in the game, check out the video walkthrough and gameplay for the game. This entry was posted in PC Games, Walkthrough and tagged Vroom Kaboom Cheats, Vroom Kaboom Gameplay, Vroom Kaboom Guide, Vroom Kaboom Hints, Vroom Kaboom PSVR Game, Vroom Kaboom Review, Vroom Kaboom Solutions, Vroom Kaboom Strategy, Vroom Kaboom Tips, Vroom Kaboom Walkthrough by Marvin. Bookmark the permalink.